Today’s Rodanthe, NC, is yesterday’s Chicamacomico, an Algonquin word supposedly meaning “sinking down sand.” Though the Native Americans named the area, the English settlers continued to use the word “Chicamacomico” (and dozens of derivations: Chickony-Commock, Chichinnacomoc, Chick, etc.) to describe the northernmost end of Hatteras Island – the Chicamacomico Banks. Rodanthe Outer Banks was populated by English settlers in the mid to late 1700s. By the late 1800s there were distinct settlements on the Chicamacomico Banks. Present-day Rodanthe and Waves were lumped together into one settlement called Chicamacomico. In 1874, when a U.S. Life-Saving Station was established in the northernmost settlement, it was named Chicamacomico, but a post office established here the same year was named Rodanthe, NC. Presumably Chicamacomico was too hard to pronounce or spell for the postal service, but no one seems to remember where the name Rodanthe came from. From then on, the village of Chicamacomico was separated into two sections: North Rodanthe and South Rodanthe. The “North” was dropped when South Rodanthe’s name was changed to Waves. It’s interesting to note for Hatteras Island history buffs that until the middle of the 17th century there was a prominent cape here called Cape Kenrick. The cape eroded away, but remnants of it are just off shore and are known as Wimble Shoals. These shifting sands and winds are constantly creating and recreating this narrow stretch of land we call Rodanthe, NC. Also on the history topic, the best Rodanthe, NC, attraction is the Chicamacomico Station, which was the first life-saving station on the Outer Banks and, miraculously, is the most intact station left on the Outer Banks. You should visit this place. The original 1874 station is the small, ornate building closest to the ocean. Its style is a combination of Carpenter Gothic and the Stick Style. Notice the intricate wooden ornamentation – this was typical of the Carpenter Gothic style and was crafted with the era’s new steam-powered saws. Each of the Outer Banks stations built in this style was similar in overall size and appearance, but each had its own unique detailing. The station was originally built 3/4-mile north of here; it was moved in 1903. A new Chicamacomico Station was built in 1911 because the original station was too small to house the crew plus the modern boats and life-saving equipment. Rodanthe is on a portion of Hatteras Island that sticks the farthest out into the sea; it is the easternmost point of North Carolina. Is it any wonder, then, that Rodanthe, NC, things to do center around watersports? 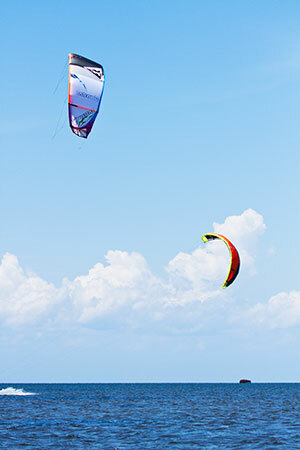 On any good wind day (which is most), dozens of colorful kite boarding “wings” give the impression of huge, multi-hued birds hovering over the ocean. On the sound side, standup paddleboarders, kayakers, windsurfers and sailors claim their own wind and water. Surfers flock to this area. 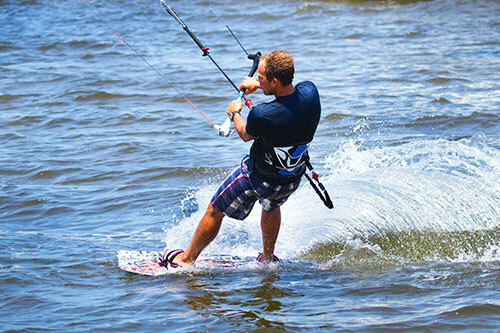 There are surf shops and other recreation-oriented stores that offer lessons for kids and adults, and several outlets can get you zipping across the sound on Jet skis. Want to stay dry? Try a local history tour, rent a buggie and go touring, test your creativity with beading or visit Pea Island Wildlife Refuge and see how many species of birds you can identify. And, of course, the mother of all sports in this area is fishing, whether from the shore, offshore or in the sounds. Rodanthe, NC, shopping reflects the old Outer Banks, laid-back style of this part of Hatteras Island. There are no national chains to interrupt the shopping scene; rather, what you get is pure Outer Banks. Kitty Hawk Kites, one of the biggest and oldest adventure companies here, is well-represented here and offers sporty clothing and accessories as well as equipment to get you outside playing. Bathing suit shops keep you outfitted. As you'd expect, there are numerous fishing tackle shops and seafood markets. Also represented are several galleries worthy of your visit. Although there isn't a large grocery store in Rodanthe, several smaller general stores can provide the basics. Rodanthe, NC, restaurants do a good job of taking care of the locals and visitors to town. While there's not the variety you will find in larger towns, you will still find satisfying options. Pizza has a front row status here, but there are also several very good seafood restaurants serving the very freshest crabs, tuna, shrimp, scallops and more, most taken right from local waters. One spot specializes in Caribbean-themed dishes, and several feature specialty coffees and treats for a morning or afternoon break. There is deli that is also a very popular breakfast stop. Dining is offered on decks in some of these places, and a few even welcome Fido! Rodanthe, NC, hotels are actually mostly called campgrounds – Rodanthe has six of them! They range from basic to resorts with amazing amenities such as pools, daily activities, laundries, stores, clubhouses and more. Several also have camping cabins that consist of one- or two-bedroom units. There is a long-lived and nicely maintained motel in Rodanthe too. The centerpiece of the hotel scene is the Waves Village Watersports Resort that offers upscale, gorgeously designed three-bedroom condos with private balconies and hot tubs. The views of kiteboarders and other wave and wind riders and the spectacular sunsets from these condos are honestly amazing. Also, there's a pet hotel in Rodanthe in case your rental house doesn't allow your furry family members. How do you pronounce Rodanthe? The biggest mistake non-locals make is to make the name into a two syllable word, as in roe-DANTHE. To speak like a local, make it Ro-DAN-thee. Was Nights in Rodanthe filmed in Rodanthe? Yep, most of the 2008 movie, Nights in Rodanthe, based on a novel by Nicholas Sparks, was filmed in Rodanthe, but some scenes took place on Topsail Island. The house that was featured in the film is a popular vacation rental option these days. Some of the top stars stayed in Manteo during the filming and were the talk of the town. The film starred Diane Lane and Richard Gere. Where is Rodanthe, NC, located on the Outer Banks? Rodanthe, NC, is the northernmost town on Hatteras Island. From Oregon Inlet and the beginning of the Herbert Bonner Bridge that takes you onto Hatteras Island, it's about a 20-minute drive. 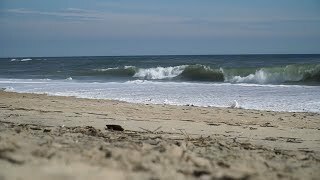 It's usually referred to as part of a three-town cluster, Rodanthe, Waves and Salvo since the towns are only a few miles apart from each other and very similar in style. Is there night life in Rodanthe, NC? Sure! Starry skies, games of cards, porch sitting, beer pong! But, don't stress if you're looking for more. The REAL Watersports complex offers live concerts and parties during the summer too. Bottom line, though: If getting wild in a bar setting while the moon shines each night is key to a successful vacation in your eyes, you're probably wanting to stay on the northern Outer Banks.